So what do you get? 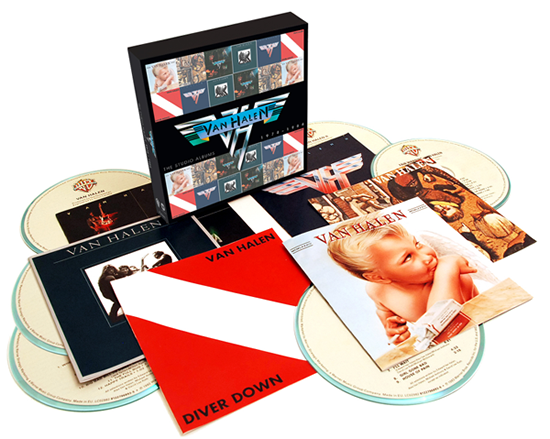 The set comprises Van Halen’s first six albums. Each disc is contained in a card sleeve showing the original album cover, and these are all packed inside a sturdy cardboard box. The downside of reproducing the album covers in CD format is that the credits on the sleeves are printed in such tiny characters that they are almost unreadable – this is especially so on the sleeve of Van Halen II where the tiny text is printed in an almost illegible light pink over dark blue! The discs all contain the original track listings and there are no extras: no alternative or extended tracks and no additional goodies in the box such as booklets or photos. What you get is just the plain vanilla editions of the six albums, exactly as they were originally released.